OSHA and EPA have issued a Chemical Safety Alert: Safer Technology and Alternatives, in response to pressures for inherently safer technology (IST) legislation. "Inherently" meaning the risk isn't and can't be present because only non-hazardous chemicals or process conditions are being used. While IST is the most desirable approach to risk management (hazard=0 means risk=0, for those who don't believe any exposure can really be "managed"), it isn't always feasible because alternatives don't exist or aren't affordable. The alert acknowledges this fact and offers that layers of safety measures may be necessary. It also acknowledges that there is no one size fits all answers. Every company has to evaluate its needs and capabilities. This is a guide and not a regulation. 1. Know Your Chemicals Your first step should be to thoroughly know and understand ALL of the physical and chemical properties of the substances present on your site. 2. Know Your Processes Next, thoroughly know and understand ALL of the hazards of the ways in which the substances at your site are handled and/or processed, including those that just temporarily sit in a warehouse. 3. Know Your Product Understand how your products may be driving some of the process safety concerns at the manufacturing facility. 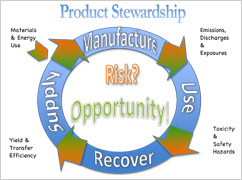 Product developers (and other members of the product team) need to work with the manufacturing site to find solutions that meet customers needs from a life cycle safety perspective.